To create Worlds, you need an account. Register, and get your password via email. 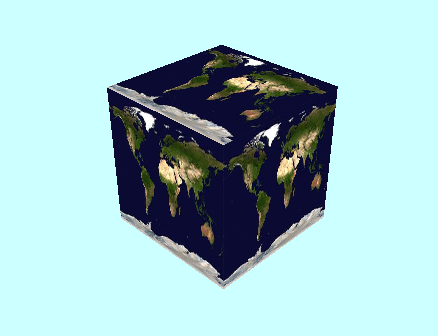 We will use "One Cube World" as a simple Starter World. Click the image to run it. This World displays a single cube on screen. You can drag and scroll the camera to move and zoom. Simple starter World (Three.js version). Cube of random color. Built-in camera control. Now you are logged in, you can click "Clone" to make your own copy. Go to the page for your clone. On the World page for your clone, click "Edit" to launch the editor. Go back to the World page and reload. You will see the new title and description. The program is a set of instructions for the computer to "execute". Instructions end with ";". This is important. You can insert blank lines, spaces and tabs in order to change the program layout and normally it does not matter. The program will still work the same. You can insert "comments". These begin with "//" and continue to the end of line. These are notes to the human reader and are ignored by the computer. You can change code, press "Save" and then "Run" the new code. Nothing bad can happen. You cannot damage your machine or our server. Change the sky color. Here is a list of color names. Change the start position of the camera. The shape is defined as a box of three equal dimensions: ( objectsize, objectsize, objectsize ). That is, a cube. Change the shape to something other than a cube by changing one of the dimensions. Every time you make a change, press Save, and Run again. Note the chain brackets. These define the start and end of blocks of code. In the World so far, we did not define any "AB.world.nextStep" because we did not have any code to execute on every step. For full reference on this structure, see the World and Mind docs. We will now add some new code at certain locations within the structure. The cube is "painted" with a random color each time we run the World. It would be nice to paint it with a JPEG or PNG image. Web search for some image you want to use. Right-click and "Copy image". Go to menu "User" - "My uploads". Paste (Ctrl-V) and the image is uploaded. You can also select an image from your computer by browsing files. The cube will now be painted with your image. In the header above, in the search box select "Uploads" to see what other people have uploaded. You can use all their uploads in your World. We want the object to move on every time step. So we must now define "AB.world.nextStep". The above code makes a random move in the x dimension on each step. Change the code to make larger or smaller moves. Change the code to move smoothly in one direction. Now we add some background music. Insert the following code at the end of the program. On some browsers (Chrome, mobile) audio will not play automatically, but only in response to user interaction. So the code gives the user play and pause buttons. See notes on audio autoplay on web browsers and in particular on Chrome. Get some music you like. One site with free music is dl-sounds.com. There are many others. When you find music you like, download the music file to your computer. Then upload the music file to Ancient Brain. Edit the code to play your music file. Errors while writing programs are normal. The important thing is to understand where the error is. The editor warns you about errors using an X icon on the left-hand side. Hover on it for info. When you save the file, you will be warned again in the pop-up. Some errors cannot be detected in the editor and you will only find out when you run the program. See the "Docs" menu for all the documentation you need when coding. AB: Above we saw AB.randomIntAtoB and AB.backgroundMusic. AB is the core Ancient Brain object. See AB docs. APIs: Above we saw ABWorld.init3d and ABWorld.scene. ABWorld is defined by the "API" that we are using for this World. This API: See the docs for this World's API. You can also select code in the editor and press "Intelligent code help" to get help on a specific function / object / word. Clone other Starter Worlds and change them. Many of them have a section of code called a "tweaker's box" at the top. This contains the easiest parts of code to change. For example, Blank Three.js World is quite simple to edit. It has multiple sphere objects, stored in a structure called an Array. When you get more advanced, you will make your own entire Worlds. The Worlds you create are only limited by your imagination. A simple starter World. An Array of spheres. Painted with textures. Random motion. The system will generate an image to represent your World. To change it, see "New image" on the World page. The site works on mobile. Show off your World to people on your mobile. For some Worlds, touch will automatically drag and zoom the World's camera. People can find your World using the search box. So give it a good name. You can embed your World on another website. See "Embed code" on the World page. Comment on other people's Worlds. The top menu turns red when you have a new comment.